The Emirates Cardiac Society (ECS) is a professional organization operating under the Emirates Medical Association. The ECS represents cardiologists, cardiovascular surgeons, and other health-care providers and allied professionals dedicated to the management and treatment of cardiovascular disease in the United Arab Emirates (UAE). In its efforts to promote safe and effective cardiovascular care in the UAE, the ECS recognizes the importance of ensuring sufficient and homogeneous training and qualifications in the management of patients with heart rhythm disorders, particularly as it involves invasive procedures. 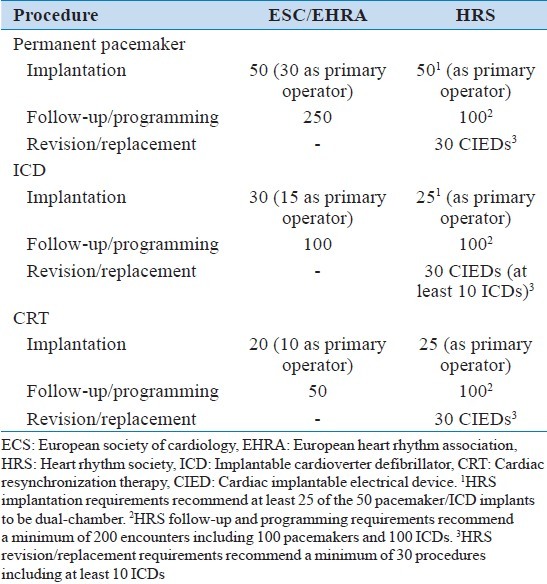 In January 2013, the ECS Board of Directors commissioned the Arrhythmia and Cardiac Electrophysiology Working Group of ECS to draft a clinical statement of the minimum requirements to achieve and maintain sufficient competency in the implantation and management of heart rhythm devices (permanent pacemakers, implantable cardioverter defibrillators (ICD) and cardiac resynchronization therapy (CRT) devices). The Working Group established a writing committee of four certified cardiac electrophysiolgists in the UAE. Based on extensive literature review including relevant documents from other professional societies [Table 1], and taking into account the working experience of the writing committee members both in the UAE and abroad, the Working Group generated an advanced draft that was circulated for comment and feedback to ECS members. The present document is the official statement generated after incorporating relevant feedback, and approved by the ECS Board of Directors. The statement is endorsed by the Gulf Heart Association and the Gulf Heart Rhythm Society. This document represents the collective professional position of the ECS as it relates to standards in the implantation and management of permanent pacemakers, ICD and CRT devices. The ECS recognizes that the present statement is non-binding, but anticipates that it will serve as a guide to relevant authorities and institutions in the licensing and privileging of physicians who implant such devices in the UAE. Competency in CIED management is a broad concept that involves knowledge of implant indications and their evidence base, patient selection and pre-implant evaluation, implantation technique, CIED programming and trouble-shooting, knowledge of the technology involved including leads and pulse generators, and post-implant follow-up including management of acute and chronic complications. Typically, CIEDs (particularly dual-chamber pacemaker, ICD and CRT devices) have been prescribed by, and to a large extent implanted by, cardiologists with specialized training in CCEP. With the expanding indications and demand for CIED implantation, there has been a move towards non-CCEP trained cardiologists prescribing and implanting these devices. In the UAE, penetration of CIED implantation is relatively low compared to the US and Europe, and this appears to be driven by factors other than lack of adequate number of properly trained and certified implanters. Nonetheless, alternate training pathways outside the traditional CCEP-training tracks have been endorsed by professional organizations elsewhere. The present document summarizes the position of the ECS on minimum standards required to attain and maintain competency in CIED implantation and management. The ECS considers competency in CIED management as a comprehensive set of requirements in knowledge, skill, experience and setting related to the operator, the support team and the center in which such devices are implanted and followed. Traditionally, a minimum of 12 months of specialized training in CCEP has been required for proficiency in the field following general cardiology training. With advancement in the field of CCEP and increasing complexity of procedures, many advanced training programs consider 12 months of training to be inadequate and require 24 months dedicated to CCEP. ,, Period of training includes proficiency in both CIED management as well as invasive management of arrhythmia with catheter-based ablations. For the purpose of obtaining competency in CIED implantation and management, the ECS recommends a minimum of 12 months of dedicated training in a structured and certified training program. The ECS recognizes that there may be instances of experienced physicians with a track record in the implantation and management of permanent pacemakers who later seek additional training in ICD and CRT implantation. These physicians may not necessarily have undergone 12 months of dedicated CCEP training. Alternate training tracks to attain competence in ICD and CRT implantation can be considered for such physicians as described below. ECS can consider a physician to be competent in pacemaker implantation if the physician participates in a minimum of 50 new pacemaker implantations and 30 revisions/pulse generator replacements. Of the 50 new pacemaker implantations required, at least 25 have to be dual-chamber systems. In addition, the physician should perform programming (including device interrogation and reprogramming) and evaluation of pacing and sensing thresholds, lead impedances, and follow-ups of a minimum of 100 patients. To maintain competency in this procedure, the physician is required to implant a minimum of 12 pacemakers/year. For any invasive or surgical procedure, larger volumes performed by an individual physician are usually associated with a lower complication rate and may be correlated with better patient outcomes. Evidence suggests that pacemaker complications are more common among physicians who implant less than 12 pacemakers per year. While implantation rates over 12 per year may be associated with acceptable complication rates, it has also been shown that more experienced implanters (at least 30 pacemakers per year) are more likely to use advanced programming features in devices and require less support from industry. The Heart Rhythm Society in the United States defines an experienced pacemaker implanter as one who implants a minimum of 35 pacemakers a year, with a minimum of 100 implants over the preceding three years. 1A. Successful completion of a dedicated training program. Confirmation of the candidate's training should be sought from their supervisor in a recognized CCEP training program. a. Definition of an experienced implanter: At least 35 pacemaker implantations per annum and at least 100 in the last three years as supported by documentation of operative logs. 1. Proctored ICD implantation experience by a cardiac electrophysiologist including a minimum of 10 implants and 5 revisions. 2. Completion of a didactic course (such as that offered by the Heart Rhythm Society) or successful completion of an approved examination. 3. Monitoring and documentation of patient outcomes and complications during the proctored period. 4. Established process for patient follow-up. 5. Maintenance of competency - at least 10 ICD procedures per year and 20 patients per year in follow-up. 1. Proctored CRT-D/P implantation experience by a cardiac electrophysiologist including a minimum of 20 new implants and 5 revisions. 5. Maintenance of competency - at least 12 CRT-D procedures per year and 20 patients per year in follow up. Availability of at least two physicians competent in device implantation and management. Appropriate nursing and technical personnel, including at least one allied professional who works regularly in implantable device management. The presence of dedicated technical support personnel (electrophysiology technologist and nurse) is preferred. Ability of the implanter and facility to handle complications. Appropriate catheter laboratory or operating theater with x-ray equipment capable of imaging in the left- and right-anterior oblique positions, and appropriately equipped with emergency care facilities (external defibrillator/pacer, hemodynamic monitoring, ventilation, drugs, pericardiocentesis kit). Appropriate equipment, including pacing system analyzers and programmers from multiple manufacturers. An identifiable and dedicated pacemaker and ICD follow-up service. In addition, if cardiac resynchronization device are implanted, appropriate heart failure follow-up service must be available. Periodic peer review of complications related to device implantation. The ECS strongly recommends maintaining of a database with all implants including patient and device identifiers (e.g. lead and device serial numbers). Data on procedure-related outcomes should be reviewed from this database on a regular basis within the facility at a minimum and preferably at a national or ECS level. This will facilitate tracking of any device and lead recalls and outcomes by the center. The ECS believes that adherence to these guidelines will support regulatory authorities to ensure that these procedures are performed by competent and qualified operators in an appropriate environment, guaranteeing safety and quality for our patients. The ECS acknowledges the following members of the Gulf Heart Rhythm Society Board for their feedback: Ahmad Hersi, Adel Khalifa, Najib Alrawahi, Nidal Asaad, and Fayez Bokhari. Endorsed by the Emirates Cardiac Society on September 28, 2013, the Gulf Heart Association Arrhythmia Working Group/Gulf Heart Rhythm Society on October 22, 2013, and the Gulf Heart Association on October 25, 2013. 1. Hayes D, Naccarelli G, Furman S, Parsonnet V, Reynolds D, Goldschlager N, et al. NASPE training requirements for cardiac implantable electronic devices. PACE 2003;26:1556-62. 2. Curtis A, Ellenbogen K, Hammill S, Hayes D, Reynolds D, Wilber D, et al. Clinical competency statement: Training pathways for implantation of cardioverter defibrillators and cardiac resynchronization devices. Heart Rhythm 2004;3:371-5. 3. Naccarelli GV, Conti JB, DiMarco JP, Tracy CM. Task Force 6: Training in Specialized Electrophysiology, Cardiac Pacing, and Arrhythmia Management Endorsed by the Heart Rhythm Society. J Am Coll Cardiol 2008;51:374-80. 4. Merino J, Arribas F, Botto G, Huikuri H, Kraemer L, Linde C, et al. Core curriculum for the heart rhythm specialist: Europace 2009;11:1-26. 5. Epstein AE, DiMarco JP, Ellenbogen KA, Estes NA 3 rd , Freedman RA, Gettes LS, et al. ACC/AHA/HRS Guidelines for Device-Based Therapy of Cardiac Rhythm Abnormalities. A Report of the American College of Cardiology/American Heart Association Task Force on Practice Guidelines. Circulation 2008;117:e350-408. 6. Dickstein K, Vardas PE, Auricchio A, Daubert JC, Linde C, McMurray J, et al. 2010 Focused update of ESC guidelines on device therapy in heart failure. Eur Heart J 2010. 7. Hammill S, Cain M. Alternate training track for ICD and CRT implantation for non-electrophysiologists: Are the guidelines too strict to be practical or too simple to protect patient care? Heart Rhythm 2004;3;376-7. 8. Chugh SS, Donahue JK, Kaufman ES, Link MS, Markowitz SM, Narayan SM, et al. The future of fellowship training in clinical cardiac electrophysiology: Program directors' perspective. Heart Rhythm 2009;6:1606-12. 9. Myerburg R. Training in clinical cardiac electrophysiology at the crossroads. Heart Rhythm 2009;6:1613-4. 10. Lindsay B, DiMarco J. CCEP fellowship training requirements: Flexibility should be an advantage. Heart Rhythm 2009;6:1616-7. 11. Curtis J, Luebbert, J, Wang Y, Rathore S, Chen J, Heidenreich PA, et al. Association of physician certification and outcomes among patients receiving an implantable cardioverter-defibrillator. JAMA 2009;301:1661,1670.